Aluminum/Aluminium extrusion profile, Aluminum windows & doors, Aluminum curtain wall, Aluminum decoration materials, Aluminum industrial parts and profile, Aluminum CNC machining parts, Aluminum heatsink, Aluminum LED profiles, Aluminum fence/handrails, Aluminum shower room, Aluminum ladders, Aluminum furnitures/cabinet, Aluminum mobile house, Aluminum moving villa, etc. AAG made complete quality management program and system, Monitor the process from product development, purchasement, production, sales and aftersale service. We passed OHSAS18001,Norway Det Norske Veritas (DNV/ISO9001),British BSI-ISO/TS16949, China GJB900IB, etc. 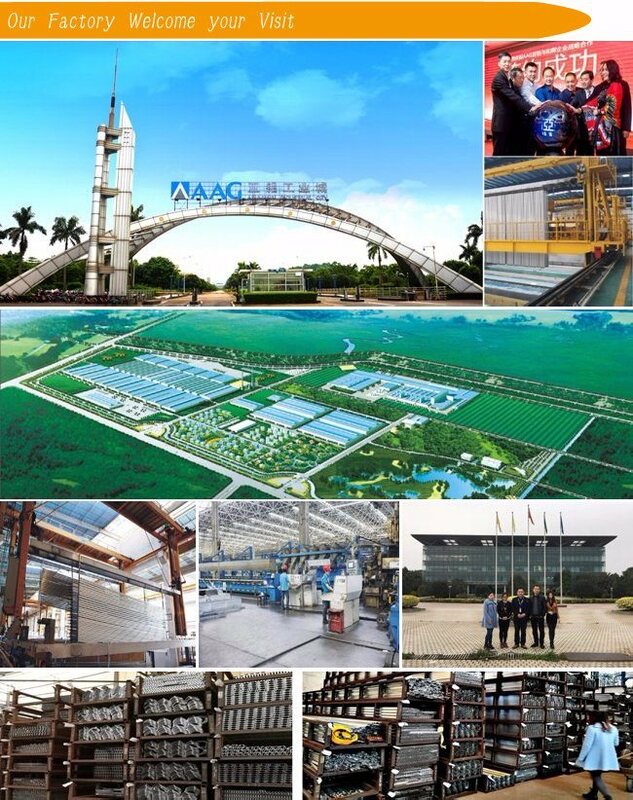 AAG own complete testing equipment from raw material to finished products. 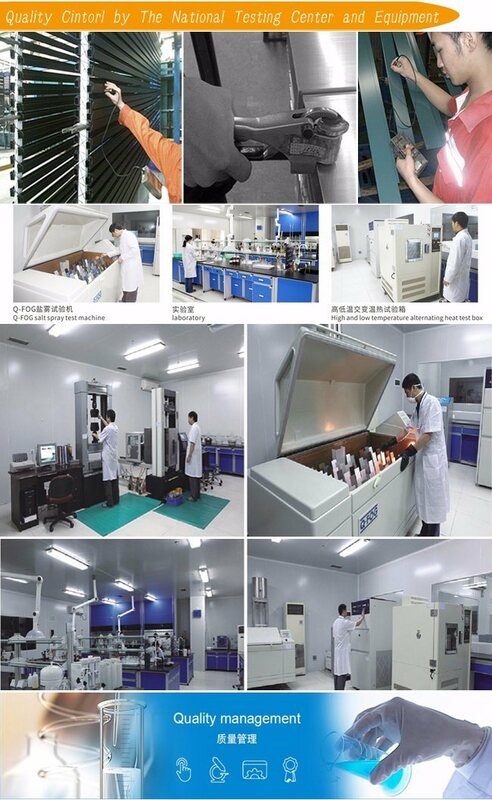 We own the most powerful curtain wall testing base in China, we passed CNAS, ISO/IEC17025 certificate of authorization, made us be able to offer you accurate,overall,scientific testing datas to our client. Extrusion lines: 44 sets imported from Japan,Italy with annual capacity 400 thousands of tons. With 5 full-automatically horizontal type and 1 vertical type. The oxidize aluminum materials length is up to 10m, electrophoretic materials length is up to 7.5m, with an annual output of 150,000tons. With 6 powder coating lines from Italy, 2 vertical spray-coating lines from USA. The longest aluminum profile can be coated is 11m, with annual capacity uo to 250,000 tons. 16.Aluminum profile for LED strip,transportation rail,ten etc. 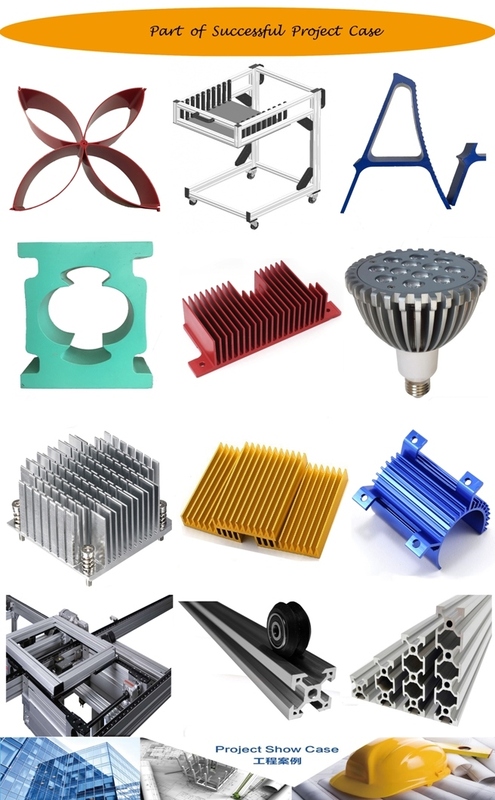 Product fabrication though machining milling, drilling, cutting and welding for different size and shape; and surface treatment for anodize, powder coating, polishing, brushing etc. 2. Outside protection: Heat shrink film to cover and protect. / Kraft paper to use. 3. With ISO9001, ISO14001, Norway DNV Certifiaction, Miltary GJB9001B Certification, National CNAS Testing Center Assessment, National Quality and Integrity Demonstration Enterprise, and other more and more certifications. 4. 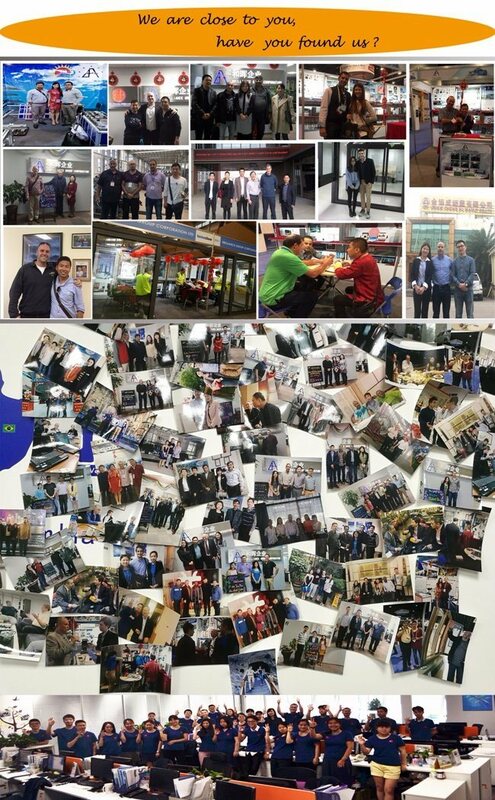 Strong Manufacturer: R&D team, 2 millions sqm workshop with equipment from Germany, Japan, USA and Italy, with our own advanced molding design and production ability. 5. Accuracy: Â The precision of design size of cutting section can reach 0.005-0.001mm. 7. Capacity: Annual 400,000 tons. Q1: Are you manufacturer ? A: Yes,We are manufacture since from 1991, is a well-known company with good reputation in China even Asia. Q2: If I need sample, could you support? A: We can supply you with the sample for free, but the delivery charges will be covered by our customers. For avoiding the misunderstanding, it is appreciated if you can provide the International Express Account for Freight Collect. Q3: What's your MOQ ? A: 1 metric ton for each model. Q4: What's the thickness for anodizing? Can you do 15 um? A: Our normal thickness is about 10 um. Yes, we can do 15um and above. Q5: What color you can do for powder coating? The thickness for powder coating? A: We can do any color for powder coating as long as you can provide the color sample. Our normally powder coating thickness is 60-80um. Q6: How do you charge the mold fee? A: Incase we need to open new mold for your ordered profiles ,the mold fee will be refounded to customers when your order quantity reaches a certain amount. Â Q7. What is the differences between theoretical weight and actual weight? A: Actual weight is the actual weight including packaging.Â Theoretical weight is identified according to the drawing,calculated by of the weight of each meter multiplied by the length of profile. Q8. How do you quote price , per ton or per meter? Q9: How many years of your windows and doors product warranty ? Q11: What color you can do for wood grain? A: Our most popular colors are Western Red Cedar, Australia Cedar, Jarrah I, Jarrah II, Chestnut, Bush Cherry, Bush Wood, Western Wood, Snow Gum, etc. If you need any other colors, we can do according to the color samples you provide. Q12: How's the weather resistance for wood grain finish D1010? A: (1). Powder: Akzo Noble Interpon D1010. Â Â (2). Wood grain film: Italian Menphis. Â Â (4). UV test:1000 hours. Â Â (5). Salt spraying test:1000 hours. Â Â (6). Normal weather: 10 years color guarantee. Q13: What certification do you have? What's your standard? A: We have ISO certification. Our standard is DIN, AAMA, AS/NZS, China GB. We got more certification from Norway and other counntries, we also passed the related certification of miltary industry. Q14: What's the delivery time for samples and mass production? A: (1). 1-2 weeks to open the new moulds and make free samples. Â Â (2). 3-4 weeks after receipt of deposit and confirmation of the order. Q15: How much the shipping cost is ? A: The shipping cost changes every month. From China to Sydney/Melbone is about USD650 for 1 20ft container. Q16: How do you pack your product? Â Â Our packages will ensure the windows arrive at project jobsite in good conditions. Q17. Are you supplying standard sizes of windows/doors or customised products ? A: Both are available. We have our own designed windows/doors series, and we also supply customised products for lots of end customers,developers and builders. Q18.Â Is there any price difference between powder coating and anodizing ? A: Yes, there is little difference. Different surface finish will make little different cost difference. We recommend you to choose anodized finish if the house is near salt water for long-effective corrosion resistance,but powder coating will be better if the house is far away from salt water. Q19. What kinds of hardware can you supply ? A: Commonly Germany brand,China top brand and Australia brand,and other brands are available. Q20: What's your payment term? A: For the fist order, we usually use 30% T/T deposit + 70% T/T before loading the container. For future order, we can do 30% T/T deposit + 70% T/T balance against B/L copy. Contact now, we will reply you in 1-10 minutes (Chinese working time).